This block creates an input for the structure block into whose worksheet it was inserted. At inserting the name of the structure block connector can be entered and the data type can be selected. The name appears left besides the block symbol. It must be unambiguous i.e. no other input or output block in the structure block may bear the same name. When inserting, therefore an unambiguous name is suggested. Any data type defined in the system can be selected. The data type of the structure block connector can be selected from a list. The size of the list depends on the number of configured data types. User defined data types can be also contained besides the standard data types. Like the connections the input block is also colored depending on the data type. 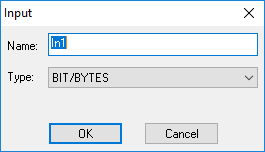 The parameter dialog is used to assign the name and select the data type. It can only be opened in edit mode. Like the connections the input block is colored depending on the data type.